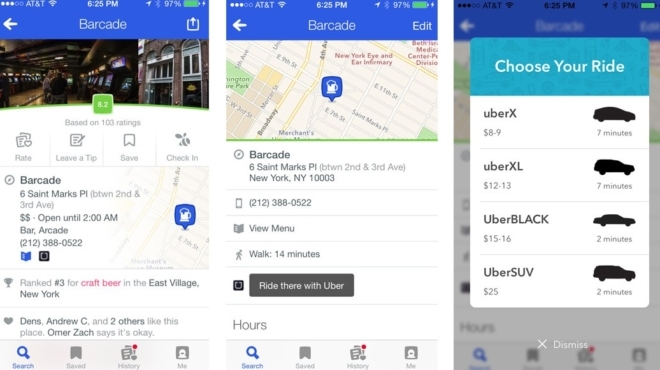 Last year, Foursquare split its app into two with the app Swarm handling the check-in part. Swarm failed to gain traction as it left out key ingridients that made Foursquare popular such as badges and mayorships. Swarm was also focused on helping users discover where their closest friends were hanging out and not measure interaction and check-ins in any way. The other part was discovery which retained the name Foursquare and acts as a directory of restaurants, coffee shops, retail locations. Foursquare has since added these features to a new update of Swarm. Now, Foursquare has partnered with ride hailing service Uber, that lets users to request Uber rides within the app through its mobile-discovery app. The partnership leverages the power of button that allows for the linking of apps together thereby enhancing experiences through different tools and services offered by those apps. When a user looks for a destination on Foursquare, the user will see the Uber button alongside other details of the intended destination. When the user taps on the button, the destination’s address loads to the Uber app where one will be able to select the car type. If the Foursquare user does not have the Uber app installed, the ride, the user gets a discount using the Foursquare Promo code. Uber has recently opened up its API to allow other apps to integrate with it which has allowed third party providers such as button to ride on. Button integrates through its deeplink commerce platform and takes a fraction of the transaction fees made through the platform.